GoGet, an initiative of Sydney-siders Nic Lowe and Bruce Jeffereys in 2002 (Newtown CarShare, read more here), officially launched in Melbourne in the City of Darebin in 2004 in Westgarth, the first carsharing initiative in Melbourne. Almost 11 years later, we have over 400 cars in the Melbourne metropolitan area. 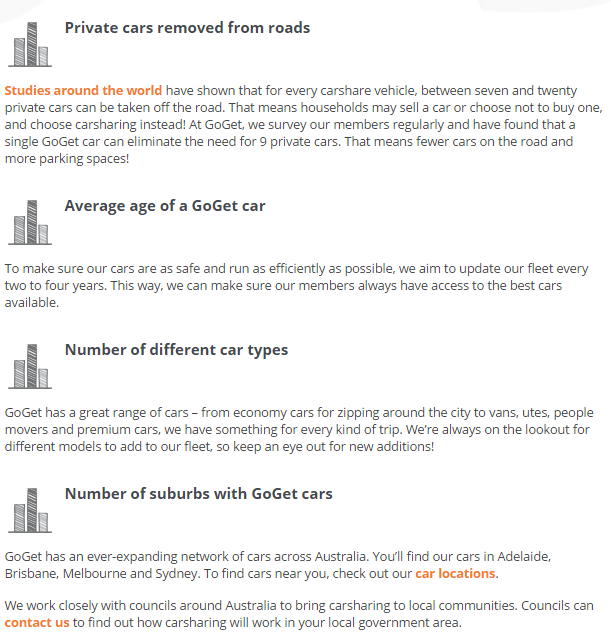 I know I’ve only been a brand ambassador for a few months with GoGet, but I know how much of an achievement that really is, especially with two competitor carshare companies also in Melbourne, and given how dependent a lot of society is on private vehicles as their primary mode of transport. Why own a car when you can GoGet? Click here to join. Why own a car when you can GoGet! Being a GoGet member is like being a part of an exclusive club: members-only access to our amazing fleet of cars, you’re saving the planet one trip at a time, and you’re saving yourself money. Who doesn’t like saving money?! I know I do. Other benefits to being a GoGet member: you’re a part of a community of like-minded people; you’ve got access to over 400 cars in Melbourne (and let’s not forget the Sydney, Adelaide, and Brisbane fleets when you’re travelling! ), there are three flexible plans on the personal membership, there’s a plan especially for businesses, and of course, you can choose from 13 different vehicles. Environmentally, carsharing is doing wonders for reducing CO2 emissions. The screen grab below highlights that one GoGet car removes the need for 9 private vehicles. Melbourne’s GoGet fleet is approximately 400 strong. If one GoGet car removes 9 private cars, that means that the Melbourne fleet has removed around 3600 cars from our roads. With a fleet that is growing rapidly in Melbourne and across the nation, you can only expect these numbers to soar! Less cars = cleaner air + more walking + more public transport usage = win for the planet. To access the highlighted information, click the image. Where can I find GoGet cars? GoGet cars are found in on-street car parks, parking complexes, and even in residential building car parks – all collectively known as pods. To find out more information on the closest pod to you, just head to the ‘Find Cars’ area on the website, pop in your address or suburb, and search. An orange pin means the car/s at that pod location are available for bookings; the grey pin means the car/s at that pod location are booked. 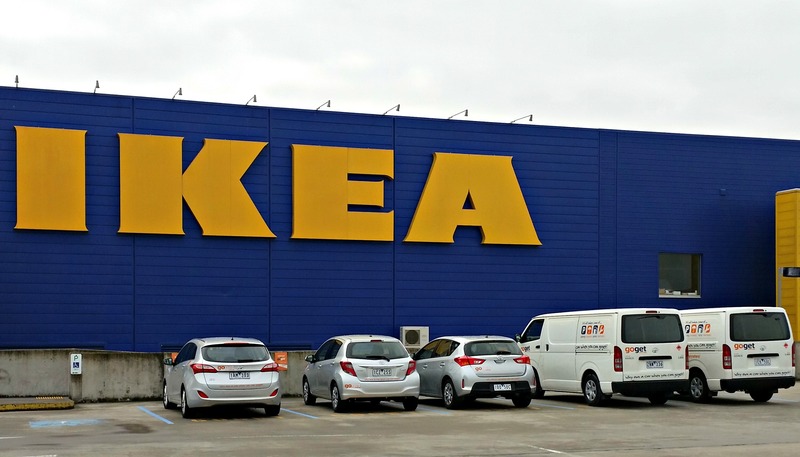 Did I mention there are also pods at IKEA Richmond (below) and Springvale? GoGet’s Melbourne team is a small, close knit team: the street team is 12 strong, our fleet ops team of two or three (who I must admit I’ve never met because I couldn’t get to our 400 car party earlier in the year), and of course, our operations team of three – Justin, Myles, and my supervisor, Chas. 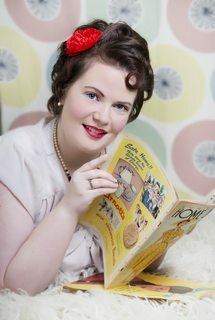 The only daunting thing about joining GoGet was needing to remember all the information to tell to the general public. I knew that I was joining a like-minded group of individuals who believe in the greater good of carsharing, and having done induction with three other guys (including Will up the top there), I never once doubted my choice in applying for a job to be a brand ambassador. Being a part of the street team is a whole lot of fun. Because we’re not clocking on and clocking off or switching on and off computers like most people do when they start and finish work, we take selfies to send to Chas so he knows we made it to the location, and when we’re leaving. Do we have fun with them? Of course we do!